Heal yourself and prevent diseases—from cancer to Alzheimer’s—by eating right, with specific advice on the surprising foods that trigger the body’s five defense systems. EAT TO BEAT DISEASE is not about making lists of foods to avoid, but instead will help you understand your body’s defense systems, and learn which healing foods and beverages you can enjoy—like chocolate, red wine, Prosciutto, oysters, nuts, cheese, and apples. And how much to eat of them, too! Dr. Li is a pioneering researcher who created a new field of medicine for fighting disease, angiogenesis, which is the process our body uses to grow blood vessels. He has found ways to trigger the body’s ability to turn cancer on and off by preventing the growth of blood vessels that feed tumors. In addition to developing paradigm-shifting cancer treatments, Dr. Li has discovered that you can get similar results by eating certain foods. His research shows that hundreds of foods, including soy, jasmine tea, San Marzano tomatoes, coffee, red wine, and even hard cheeses like Jarlsberg and cheddar, can support the angiogenesis defense system. The book will focus on the foods that trigger the five newly discovered defense systems: Angiogenesis, Cell Regeneration; Gut Microbiota; DNA Modification/protection; and our Immune System, all of which help fight Alzheimer’s, Macular Degeneration, vascular disease, diabetes, psoriasis, and other debilitating afflictions. 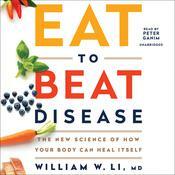 Both informative and practical, EAT TO BEAT DISEASE explains the science of healing and prevention, what elements of foods help your system, and provides practical takeaways and an eating plan. Heal yourself and prevent diseases—from cancer to Alzheimer’s—by eating right, with specific advice on the surprising foods that trigger the body’s five defense systems. EAT TO BEAT DISEASE is not about making lists of foods to avoid, but instead will help you understand your body’s defense systems, and learn which healing foods and beverages you can enjoy—like chocolate, red wine, Prosciutto, oysters, nuts, cheese, and apples. And how much to eat of them, too! Dr. Li is a pioneering researcher who created a new field of medicine for fighting disease, angiogenesis, which is the process our body uses to grow blood vessels. He has found ways to trigger the body’s ability to turn cancer on and off by preventing the growth of blood vessels that feed tumors. In addition to developing paradigm-shifting cancer treatments, Dr. Li has discovered that you can get similar results by eating certain foods. His research shows that hundreds of foods, including soy, jasmine tea, San Marzano tomatoes, coffee, red wine, and even hard cheeses like Jarlsberg and cheddar, can support the angiogenesis defense system. The book will focus on the foods that trigger the five newly discovered defense systems: Angiogenesis, Cell Regeneration; Gut Microbiota; DNA Modification/protection; and our Immune System, all of which help fight Alzheimer’s, Macular Degeneration, vascular disease, diabetes, psoriasis, and other debilitating afflictions. Both informative and practical, EAT TO BEAT DISEASE explains the science of healing and prevention, what elements of foods help your system, and provides practical takeaways and an eating plan.